In May of 2014, the Lerner Center received a grant from the New York State Health Foundation to address neonatal abstinence syndrome. The grant, “Engaging the community to prevent drug dependent newborns”, started on May 15th 2014 and ended July 15, 2015. The work of the grant is an essential piece of the efforts lead by Onondaga County Health Department (Health Department), and the Department of Long Term Care Services, to reduce perinatal substance use in the county. It is also a priority indicator within the New York State Department of Health’s Prevention Agenda. This grant was awarded to address the pressing issue of a high rate of newborn drug related hospitalizations in the County. 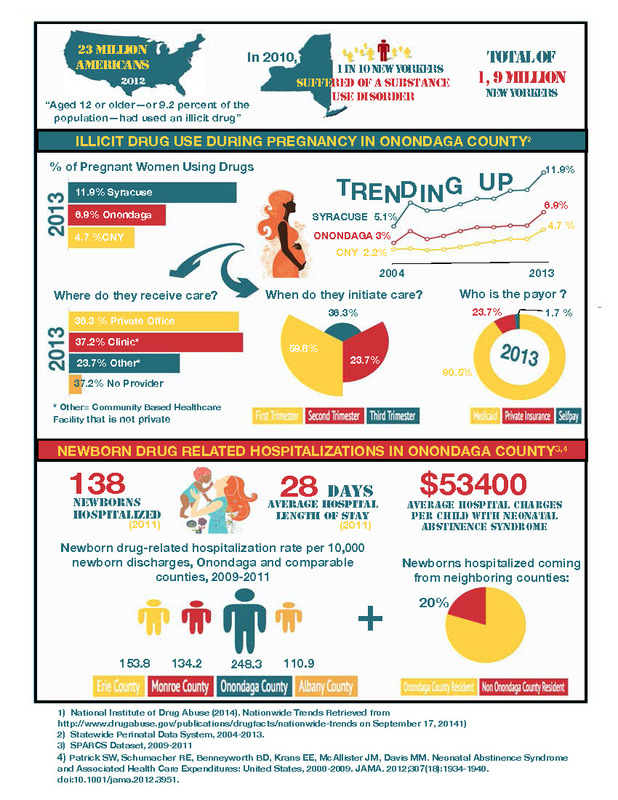 Onondaga County has the highest rate of newborn drug related discharges in the State of New York, with 248.3 discharges per 10,000 births compared to the state average of 72.6. This is a three-fold difference. Click here for a PDF of the infograph. The work plan of the grant addressed two main needs identified in the Onondaga County Health Assessment and Improvement plan in 2013, in relationship to perinatal substance abuse. The first related to the need for an overarching collaborative to bring together five distinct community initiatives thereby reducing duplication of efforts and increasing efficiency of these initiatives. The second involved the need to increase utilization of the existing resources available to prevent and reduce perinatal substance abuse. Goal 1: To formalize a unified collaborative to address perinatal substance abuse in Onondaga County. Goal 2: To strengthen community engagement in prevention and identification of perinatal substance abuse through the implementation of a model of community connectors. 1. Convene the key community and government partners to agree on a common agenda. Read the Think Tank Meeting Report. 2. Define a durable strategy to address prevention of opioid use that is integrated into medical care and community health, closely tied to Healthy Families, and that does not duplicate current ongoing services. The Lerner Center served as a facilitator of the development process of the collaborative, and the development of the Community Connector Model. The facilitation process was from the start carried on in close partnership with the Health Department. This close collaboration allowed the development of a transition plan to make sure that all grant-related efforts will be continued in the future.